State of Michigan, Flint broke law and covered up lead levels in water, expert says. 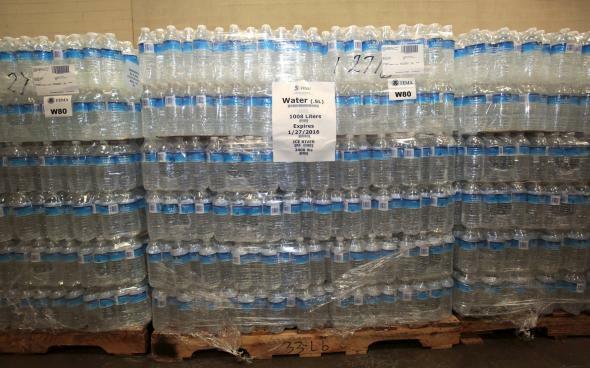 Stacks of bottled water waiting for distribution to the public at a Food Bank of Eastern Michigan warehouse in Flint on Dec. 16, 2015. Michigan governor Rick Snyder declared last week that the poisonously high levels of lead in drinking water in Flint, Michigan constitute a state of emergency. “The health and welfare of Flint residents is a top priority and we’re committed to a coordinated approach with resources from state agencies to address all aspects of this situation,” Snyder said. Reporting by Michigan Radio and research by the ACLU, though, alleges that the state government itself may have broken laws last year to cover up evidence of high lead levels that were turned up in tests it was supervising. To recap the situation briefly: Flint was run from 2011 until April 2015 by emergency managers appointed by Snyder. * In 2014, to save money, the city began using the polluted Flint River as its water source. The drinking water from this new source created a number of health threats, including high levels of lead. (Lead can leach into drinking water from lead pipes.) A study released in September 2015 concluded that the change has put Flint children at significantly increased risk of lead poisoning. The city has now switched back to its old water supply, but lead levels are still high, and the state government is distributing bottled water to residents. The U.S. attorney’s office for the Eastern District of Michigan says it is investigating whether the water-contamination disaster involved any criminal activity. Snyder has since appointed the emergency manager who supervised Flint’s transition to Flint River water—Darnell Earley—as the emergency manager of the Detroit Public Schools. *Correction, Jan. 29, 2016: This post originally implied in error that Flint is still run by an emergency manager. The city’s period of emergency manager control ended in April 2015.